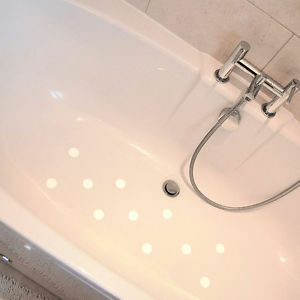 These non-abrasive anti-slip tapes are perfect for barefoot areas such as bathtubs, showers and pool areas. 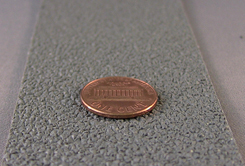 PHENOMENAL wet slip resistance for a non-abrasive anti-slip tape! More aggressive and slip resistant than our standard Aqua-Safe non-skid tape (below), but still water-safe. Ideal for ANY situation, but especially water applications such as pools, boats and showers that need to be very anti-slip. 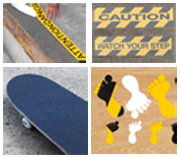 Click here for Abrasive Anti-Slip Tapes. 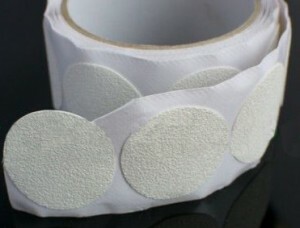 Standard Aqua-Safe tape (below) has good slip resistance for food prep areas and showers where cleanability is of the utmost importance, whereas our Coarse Resilient (above) has GREAT slip resistance for boats, pool decks, and other areas where slip resistance is of the utmost concern. Here is some more information on our non-abrasive and abrasive non-skid tapes and slip test data on them. Standard Aqua-Safe non-abrasive anti-slip tapes have an embossed surface, which are good for barefoot areas and food preparation areas. They are easier to clean and kinder on bare skin than our abrasive anti-slip tape. For areas that need great slip resistance, we always recommend our Coarse Resilient Aqua-Safe tape (above), as it has much better slip resistance. Combines a cushioned surface with excellent slip-resistance in an anti-slip tape. Great grip tape for areas where workers may be standing for long periods of time, pool decks, and anywhere you could use some cushion as well as excellent non-skid without the tripping risk that mats can create. Available in gray only. 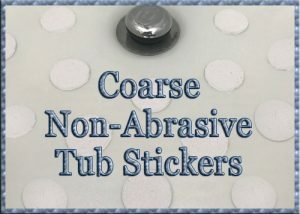 Slippery tub solutions: we carry round white Aqua-Safe tub stickers for making tubs and showers anti-slip. 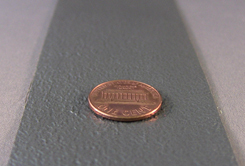 Check out our abrasive anti-slip tapes as well! They are designed for wet use also. Anti-slip tape orders can be ordered securely online, placed by phone (1-800-988-6721), or e-mail us with any questions. We have the best prices and the best abrasive -- durable aluminum oxide. All of our tapes are for indoor and outdoor wet area applications. We can also order the sorts of items pictured above from our factory ($100 minimum order), make custom colors (on orders of 10,000 square feet or more), cut them into custom shapes (minimum order of 100 pieces), and print whatever you want onto all of our anti-slip floor tapes. 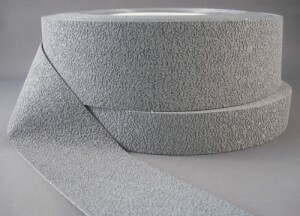 We also carry aluminum-backed, conformable anti-slip tapes for diamond plate and other irregular surfaces, and bolt-down aluminum anti-slip plates with coarse anti-slip tape already applied. We offer specially discounted anti-slip tapes that were cut to the wrong size for particular customers or are in discontinued colors. Get these non-skid tapes at a discount! We also carry photoluminescent/glow-in-the-dark egress marking tapes.